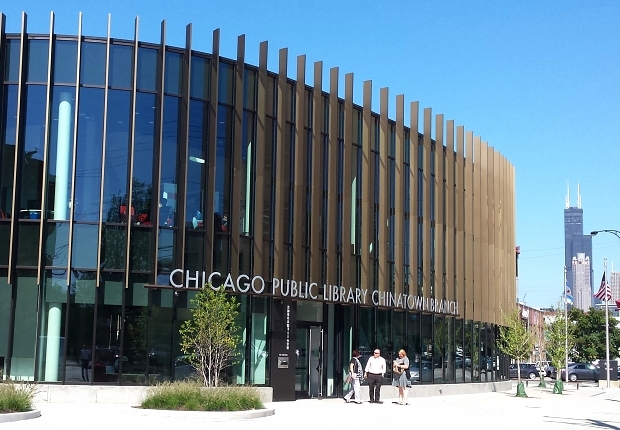 Chicago has been doing great things reinventing libraries as creative spaces, alongside the traditional knowledge-sharing, book-lending kind of library functions. I met the Commissioner of the Chicago Public Library System, Brian Bannon, at the LEGO Idea conference in Denmark earlier this year. 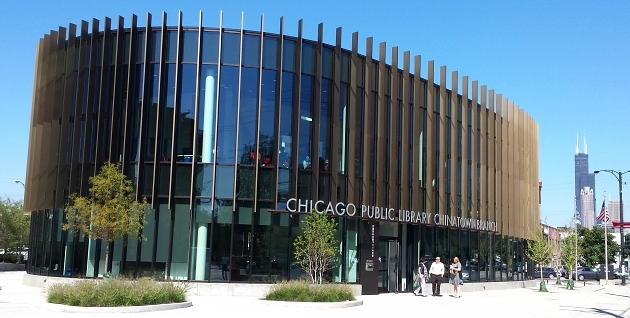 Having the head of Chicago’s libraries at that conference about creativity and play seemed striking – and he did a great Pecha Kucha talk about the transformative power of libraries. 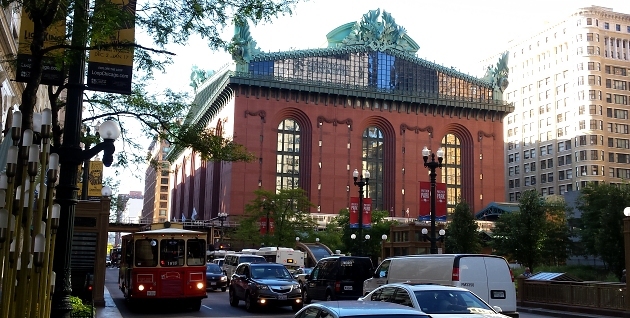 So then they invited me to come and see some of the things the Chicago Public Library System is doing, meet the Executive Board, and to do a talk and workshop at the Harold Washington Library Center, the huge main library in downtown Chicago. Mark was a fantastic organiser and host for my whole visit. You see here Mark with some machines and 3D printers, but the Maker Lab is used for all kinds of making – for example, in the afternoon a flower arranging workshop was taking place. 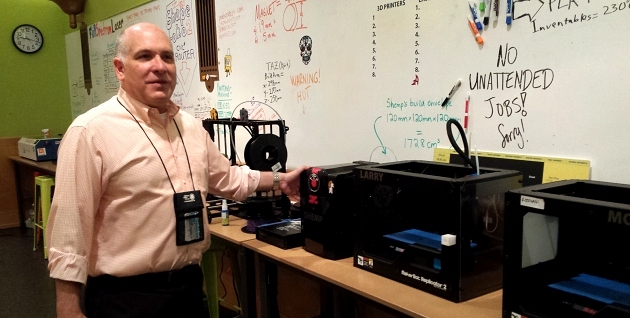 → Mark explained that the Maker Lab is, in part, an ‘on ramp’ for people to get into makerspace kind of activities. Being in the library, it is less intimidating and strange than other dedicated makerspaces, to those who are unfamiliar with them. 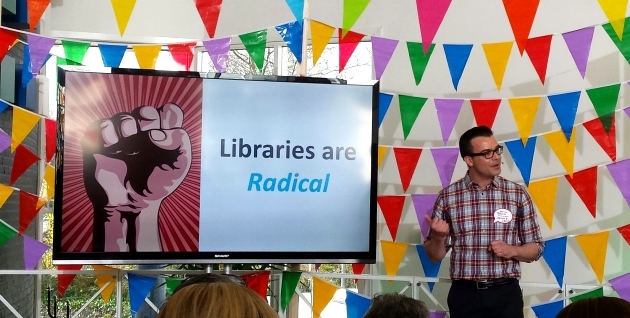 I thought this was a good point – if you don’t really know what you’re doing, a library and librarians may well seem more approachable than a place already full of techno-enthusiasts. → They make sure that all classes and sessions include a creative dimension, rather than just downloading readymade designs, so that people can have that feeling of ‘I made this’. 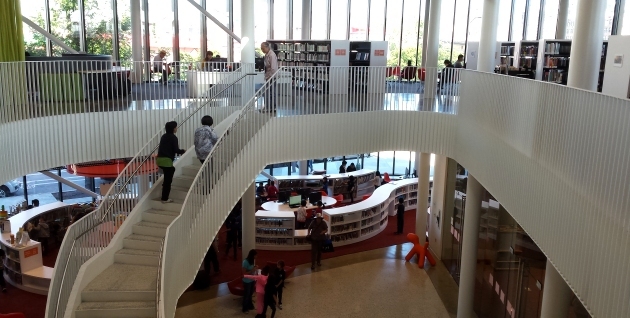 → Staff come into the central library from across the 80 branch libraries, to help out and learn new skills. Everyone jumped in, Mark says, eager to learn. Librarians, he notes, are good at helping people find things out – they don’t have to be experts in a thing already, they can just work alongside library visitors and say ‘let’s see, let’s try this out’. → They have a ‘One Book, One Chicago‘ project, where everyone in the city is invited to read one book each year. This year they have tied that into Maker Lab activities by having sessions where visitors can build scenes from the book – a neat idea, I thought, tying together different ‘programs’ (as they call them). → Chicago Public Library System partnered with Ideo on a project, ‘Design Thinking for Libraries‘, which offers a downloadable toolkit to help reflect on the purpose of libraries and to create new opportunities for people to engage with their library, and to make and learn together. → Andrea Telli, Assistant Commissioner for Neighborhood Services, related that there’s now a noticeable change where people are now coming into their libraries thinking “I wonder what’s happening here today?” – a happy sense of surprise and curiosity. → The original idea for the Maker Lab was that it would be a six-month ‘pop up’ happening, which would then be replaced by something else. But the popularity of the Lab meant that there would have been uproar from both library users and library staff if they had tried to get rid of it. So that’s some of the things I learned on day one. Coming next: day two!